We've been hard at work in March cooking up some amazing new features for our Zesties. We're always cooking up big things at Zestful, and we have some sweet treats for you going in to this week. You've asked for them, and now you have them! Each person in Zestful now receives two cards: One physical Zestful card, and one virtual one. Both can be used interchangeably to spend your Zestful balance. And everyone that has a Zestful account already has a virtual card activated - check it out by clicking on "My Cards" from the left navigation anywhere in the app. It really comes down to two words: Speed and convenience. Now instead of waiting for your physical card, or forgetting it at home, you'll always have access to your virtual card by logging in to your Zestful account on your computer or phone. Previously Zestful required that you keep 100% of your Allocated Balances in your Zestful account - no more. Going forward we've adjusted the Minimum Required Balance and made it much easier to see what your current Zestful balance is. We're striving to make it easier than ever for you to get started in Zestful, and reducing the balance amount to get started is just the newest way in making that better! The Current Balance is simply the total amount that is currently in your Zestful account. This is the balance that is used as your employees use their balances. Your Total Allocated Balance is the total amount that you've given to your employees to spend within Zestful across all your Programs (Allowances, Rewards and Peer to Peer). The Required Minimum Balance is the minimum balance that we require to be in your Zestful account at any given time. If your balance goes below the required minimum (e.g. as employees use their balances), we will initiate a debit from your funding source to get the balance back up to the minimum required amount. The Required Minimum Balance varies depending on how much your Total Allocated Balance is within your account. We require that at least 30% is within your Zestful account at all times. For example, if your Total Allocated Balance is $12,000 your Minimum Required Balance would be $3,500. We require a Current Balance of at least $300 in your account. For example, if your Total Allocated Balance is $500, we would require that $300 is in your account at all times. We require that your Current Balance is 100% of your Total Allocated Balance. For example, if your Total Allocated Balance is $150, we would require that $150 is in your account at all times. Many of you have requested an easier way to send multiple rewards with different amounts to different people. Before the easiest way to do that was one at a time, but not anymore. 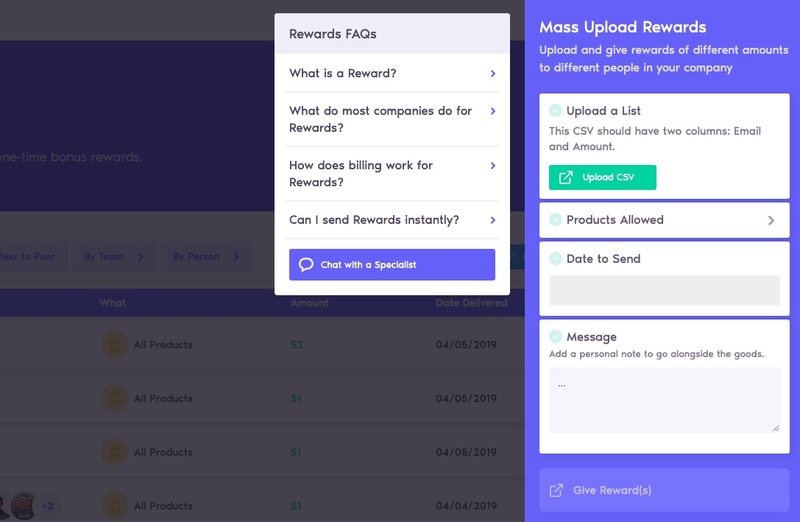 Going forward you'll be able to do a mass upload for rewards, which allows you to upload a spreadsheet with different emails and different amounts, allowing you to send hundreds of rewards of different amounts instantly! We're always trying to make Zestful faster and more reliable, so you may notice some overall enhancements as you use the product!